SOURCE: 01-18-19 - Bloomberg - "Confidence Busted. Consensus Broken. And a Rally Like Few Others"
Every inflow matched by a hedge. Volume is down -- Those sidelines must be crowded? Analysts are fickle, at odds, or AWOL. In a weird dichotomy, the S&P 500 just rose for a fourth straight week, yet U.S. equity funds saw outflows of $7.7 billion in the five trading days through Wednesday, according to a BAML note citing EPFR Global data. Stocks started the year in a once-in-a-decade rally, yet so-called fast-money investors including hedge funds and quants were slow to join in. The shock of the fourth-quarter sell-off across risk assets appears to have helped fuel the dissonance. 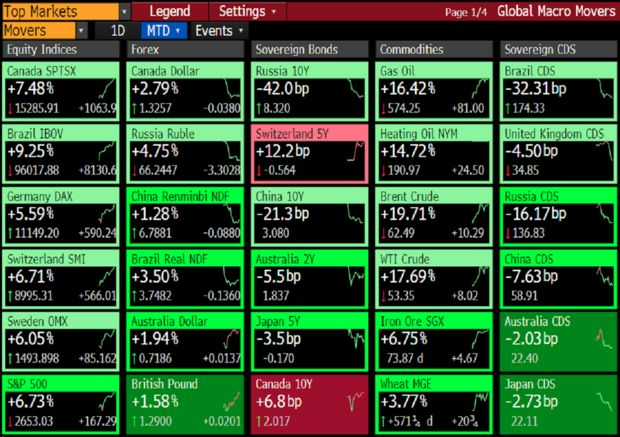 Beneath the sea of green in risk assets right now is a rippling tide of doubt and anxiety. On the surface, the picture is approaching perfect. The S&P 500 Index, off to its best start since 1987, just posted a fourth weekly gain. It’s up 13 of 17 days since Christmas and the moves are being matched step-for-step by global stocks. Volatility keeps receding. Commodities and emerging-market equities have surged. Leveraged loans advanced again. High-yield bonds did, too. Yet 2019’s stellar start still lacks something to prove it’s more than a dead cat bounce in a new downtrend: conviction. Every price gain seems matched by an outflow, every inflow matched by a hedge. Analysts are fickle, at odds, or AWOL. And volume is down -- those sidelines must be crowded. The lack of consensus in markets was laid bare this week by Bank of America Merrill Lynch in their latest global investor survey. 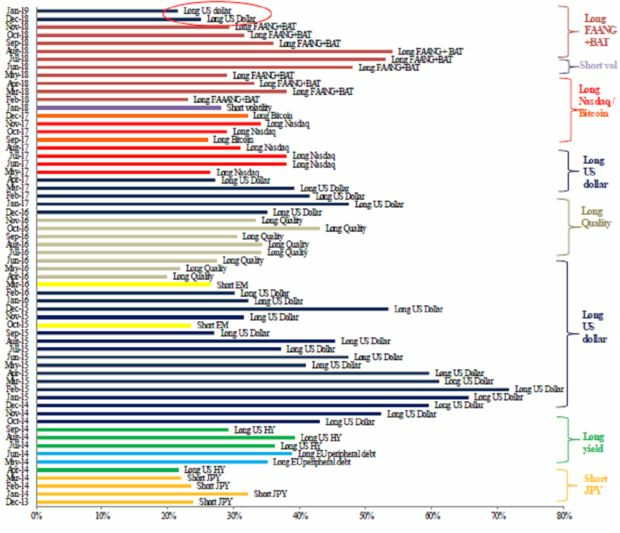 According to responses from 177 participants across the world managing $494 billion, the most-crowded trade is being long the U.S. dollar. But at just 21 percent, it’s the weakest consensus trade in almost three years. This trend is months old, which is where August comes in. The survey’s previous most-crowded trade -- a long position in tech stocks including Facebook, Amazon and Baidu -- peaked in August, when 54 percent of money managers concurred it was the hottest investment around. The shock of the fourth-quarter sell-off across risk assets appears to have helped fuel the dissonance. Chris Bailey, a European strategist at Raymond James, said amid the search for winning strategies he had more client meeting requests in December than ever before. The uncertainty was evident this week even as most risk assets extended their impressive run. 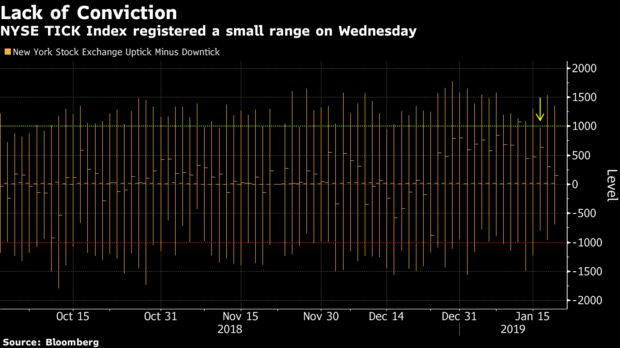 The NYSE TICK Index, which measures the number of U.S. stocks going up, trade-by-trade, versus those going down, failed to register a reading of 1,000 in either direction Wednesday for the first time since early November. 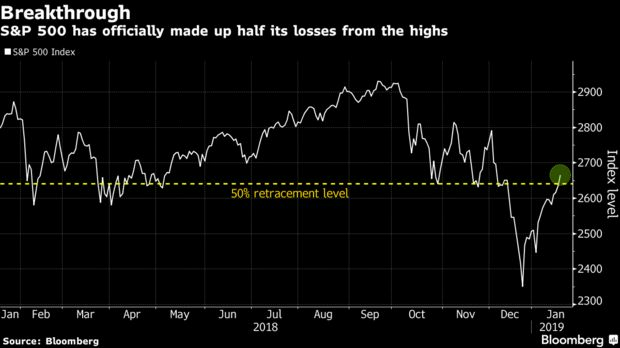 “With the SPX equidistant from its correction low and all time high, we can understand why there’d be an air of indecision right now,” Frank Cappelleri, senior equity trader and market technician at Instinet LLC, wrote in a note to clients. In a weird dichotomy, the S&P 500 just rose for a fourth straight week, yet U.S. equity funds saw outflows of $7.7 billion in the five trading days through Wednesday, according to a BAML note citing EPFR Global data. Stocks started the year in a once-in-a-decade rally, yet so-called fast-money investors including hedge funds and quants were slow to join in. Sampere reckons incoming full-year earnings reports can help investors form a consensus. But analyst downgrades to global profit expectations have been exceeding upgrades by the most since 2009, and still the January boom for stocks continued. The fractured views stretch beyond equities. The recent rapid plunge and then rebound of junk debt threw analysts into turmoil, exposing an evident lack of conviction across the market. 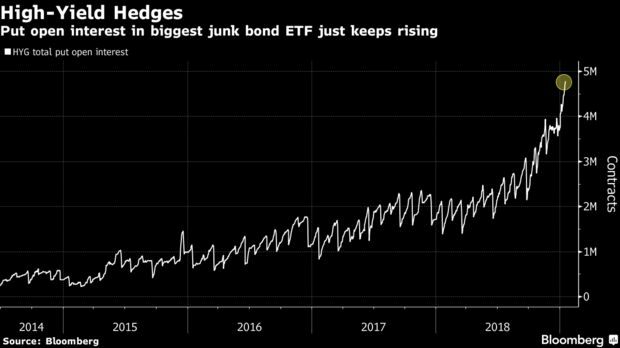 The largest exchange-traded fund investing in high-yield debt posted a record inflow a week ago, and remains significantly up on the month. Yet at the same time open interest in put options for the fund -- that is, bearish contracts that permit a holder to sell shares at an agreed-upon price -- are at a record. To strategists at BNP Paribas, these kinds of divergences boil down to a bipolar view of the financial world. Markets are right now caught between two outlooks, according to Edmund Shing and Eric Oynoyan: on the one hand the threat of a recession, and on the other the potential for financial conditions to ease. Sooner or later one view will prevail, so BNP advocates “V-shaped payoff trades” using options that benefit if there’s a renewed stocks surge -- or a dash to havens. John Roe, head of multi-asset funds at Legal & General Investment Management Ltd., which has about 985 billion pounds ($1.3 trillion) under management, said he’s carefully watching where a large part of the market will gather so that his firm can do the opposite. They may accept it, but perhaps not everyone wants to chase those updrafts. ETFs with the word “Quality” in the name took in $2.1 billion in the first half of January, Bloomberg Intelligence said this week. That’s a sign of investors adopting more defensive positions. With caution abundant and conviction absent, Investec’s Rimmer isn’t the only strategist making crisis-era comparisons in the current environment. Ulrich Urbahn at Berenberg said the difference now is an added layer of political uncertainty. How long that lasts is anyone’s guess, but it was evident in trading volumes on U.S. exchanges this week. They were depressed, with three days seeing fewer shares change hands than the 10-year average.